Height: 5' 9" Weight:232 lbs. Background: He was considered too short to play inside linebacker in the physical NFL. Sure, Sam Mills was a star in the upstart USFL but the NFL is a different level of play. When Jim Mora first brought Mills with him to the Saints from the USFL, he saw Mills on the practice field with other NFL players and said Mills looked "short." While Mora wondered how Mills would fare, it did not take long for Mills to reward Mora's confidence in him. Mora later called Mills the best player he had ever coached. Mills played nine seasons for Mora with the Saints and he was brilliant, part of of the first four playoff teams in team history while serving as captain and signal caller of the defense that became one of the very best in the NFL, if not the best. Part of the best corps of linebackers in NFL history, "The Dome Patrol," with Rickey Jackson, Pat Swilling and Vaughan Johnson, Mills had an incredible knack for diagnosing plays, finding the ball and ball carrier and displaying the best form tackling you will ever see. He played in all 16 games in seven of the nine seasons he was in New Orleans. He routinely led the team in tackles annually, recording over 100 tackles in five different seasons. He recovered 17 fumbles and forced 16. He recorded 10.5 sacks and had four interceptions. He was named first-team All NFL in 1991 and 1992. Mills was allowed to leave for Carolina after the 1994 season and he remained outstanding for the Panthers from 1995-97. Mills died way too young. He was a great player and a great person and teammate. Greatest Moment: It was Dec. 26, 1992. In the midst of a playoff run, the Saints faced the New York Jets at the Meadowlands on the day after Christmas. Mills gave Saints fans a late Christmas present. In the first quarter, Browning Nagle had the Jets driving, looking to take the early lead. As he dropped back to pass, Nagle cocked his arm to release the ball. Amazingly, Mills took the ball right out of his hand and raced 76 yards for a touchdown to give the Saints a 7-0 lead en route to a 20-0 victory on the final day of the regular season to give New Orleans a 12-4 record. 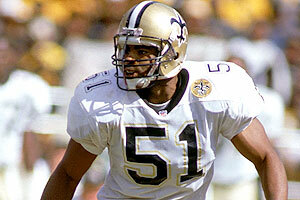 Honors: Mills was inducted into the Saints Hall of Fame in 1998. He was inducted into the Louisiana Sports Hall of Fame in 2001, the Greater New Orleans Sports Hall of Fame in 1992, the Sports Hall of Fame of New Jersey in 2003 and was inducted into the Carolina Panthers Wall of Honor. 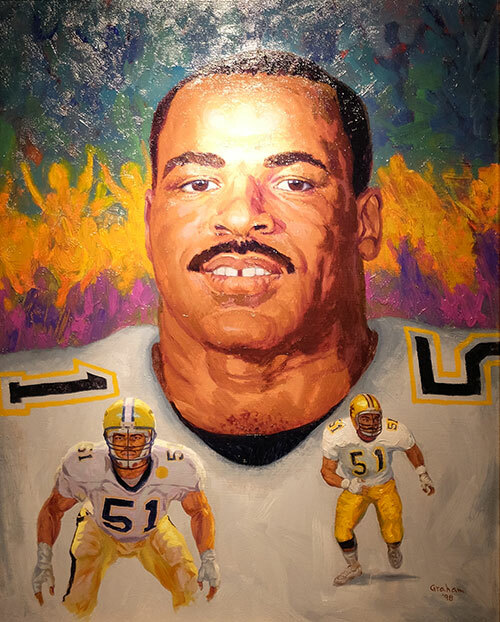 Mills was named first team All-Pro in 1991 and 1992 and was named to Pro Bowls in 1987, 1988, 1991 and 1992.